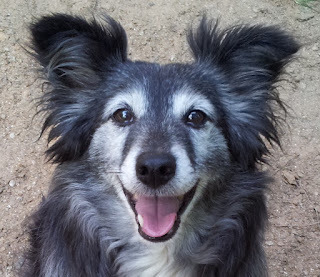 You may remember my little write up about Gracie at the CPE trial this past weekend. We got her photos today! Yeah! This is an historical moment - Gracie's first photos of her doing agility. And I have to say she looks pretty darn serious about it, don't ya think? Interesting to see how different she jumps than me. I am 15.5" and jump 16", Gracie is 18.75" and jumps 20-22", depending upon the venue. Any experts out there have comments on her jumping style??? Sure would love to have it critiqued! Gracie absolutely loves the sprinkler. She could play with it for hours, jumping and biting and howling at the darn thing. Since it's been so hot here this year, she's gotten in a lot of practice, and continues to perfect her technique, and she gets a great bath at the same time! Now all Mum has to worry about is getting those darn hoses back in the Garden Hose Reels. Gracie and I went for training this week and I wanted to report that it was GREAT!!!! We had another private with Trainer J and got to work on some good stuff. Gracie went first and was kind of sniffy and unmotivated at the start, so unlike her trialling speed. When she's like that it sure is hard to get a handle on directing her because it's sooo different than at a trial. So Trainer J recommended we rev her up! Now Mum has to admit that she never thought of revving Gracie up, 'cause she's so wacky and wild at trials. But when they did rev her up, Gracie took those obstacles just like she was at a trial. So that helped her and Mum get some rhythm and timing down; and allowed them to focus on commands for certain situations, like turning tight and turning wide. It really helped them. My sis took those obstacles like a pro, and was speedy and accurate with her weaves, contacts and turns. Way to go Gracie! Then it was my turn. Mum tried out some rear crosses with me since I'm really starting to love them and it was practice after all. A couple of them seemed really awkward, but then we got our timing down and they were smooth and tight. That's one of the things we've been working on, me not going so wide and Mum helping me to be tight. I was trying to be so tight on one jump that I wiped out before the jump, slipping in the wet grass as I tried to collect myself. Another thing we've been working on is Mum getting commands out early and directing me so I know EXACTLY where I'm supposed to go when and don't have to think about it too much. Helps keep me speedy and I don't have to make my own decisions. I had a bit of dog walk contact issues this week, so we worked on that. I have running contacts and sometimes get pretty excited and try to jump them early, especially if Mum doesn't see them through with me. Mum and I are going to work on me being independent about my contacts, whether she can be there with me or not. We've also been working on weave and teeter speed. Well, there was no trouble with that this week! Mum's hopeful that I'm getting the fact that I have to be speedy on them both, all the time. We're gonna keep on it. Turn commands for Gracie; here for tight, come for 'come toward' her. Revving up Gracie before practicing in the back yard and never letting her slow down so they can work on 'real trial' types of situations. Weave and teeter speed for me. Mum getting those commands and moments out early so both Gracie and I know what we need to do. Mum also has to think about Gracie's contacts. She was always trained for running contacts, but as she gets more confident and independent in her runs, will she stick to hitting them? Does Mum need to get her to do a 2o2o? Hopefully not. In all the time Gracie has been training, I think Mum can count just a couple of fingers of times that Gracie has missed her contact; so they may be OK. Something they will have to think about. BTW, we were thinking. Back when Mum started training me a couple of years ago, 2o2o was all the rage for nearly every dog. 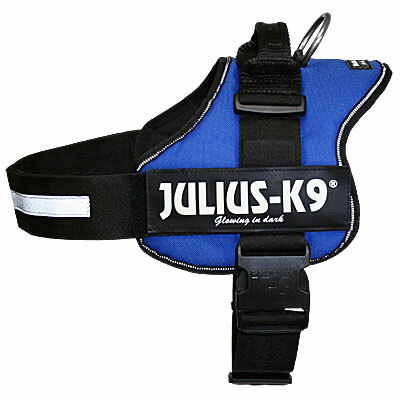 Now it seems that 90% of the dogs we see run in trials are doing running contacts, trying to get those extra seconds. How do you agility enthusiasts do your contacts? We're pretty curious, is everyone moving from 2o2o to running contacts, did you start training with running, or are you sticking with 2o2o for good. What's your take and what's your plan? Looks like the 90 degree heat has finally subsided around here and we may be able to get more practice in in the backyard. Yeah! Today is National Holistic Pet Day! As many of you know Mum and I practice holistic health methods as much as we possibly can. I get chiro, accupuncture and massage; Mum gets Reiki and chiro. And we use holistic remedies like Traumeel for skin cuts and bruises, Bach Flower remedies for stress and traumas, yogurt for my IBS and many others. And we have a holistic vet that shares our belief in being healthy. 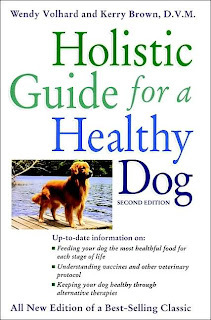 How can you help your pet be more 'holistic'? 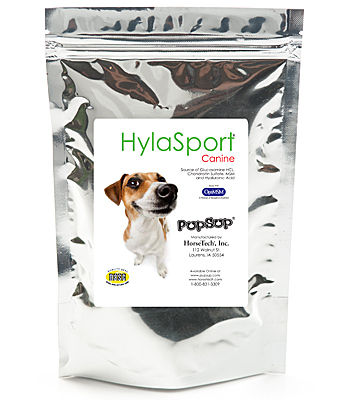 Feed your pets a more natural food diet containing the freshest ingredients you can afford and manage. Avoid foods with artificial flavors, colorings and other unnatural ingredients. Cut back on unnecessary vaccinations by doing your homework and talking to your vet about titers. Titers are tests to see if you have the necessary amount of medicine or antibodies found in your blood. You may not need all those vaccines and titers will help you know. Cut back on drugs. Seek out alternative and holistic methods, like supplements and vitamins for treating certain diseases, and chiro and accupuncture for pain. These are just a few ideas. And of course you should always consult with your vet when making any major decisions about your pet's health. But hopefully National Holistic Pet Day will bring more awareness to the ever increasing healthy alternatives to conventional medicine! Dr. Shawn - the natural vet has a veterinary practice, and he is author of many articles about holistic methods, as well as a featured host of the Natural Vet on Martha Stewart's Sirius Channel. American Holistic Veterinary Medical Association - an organization whose purpose is to function as a forum for the exploration of alternative and complementary areas of health care in veterinary medicine. Here you can search for a holistic vet near you, as well as garner wonderful information about the topic. Here is a quick vid from Dr. Shawn talking about holistic methods. He has several vids on YouTube. Check 'em all out! Not too long ago a friend of ours video taped a few of my runs. We were so grateful that we finally got to see a few runs on 'good quality' video, so unlike our little digital camera vids. But when it came time to email them to me, we had some figuring out to do, because the files were so large. First she tried a couple of her email accounts to send from, then sent them to a couple of my accounts, but she kept timing out. Eventually she sent them through a web service that specializes in just this type of thing and can send large files over the Internet. And yeah! I got my vids. Now Mum can study them and see what she did wrong! BOL!! On this day, just two years ago, one of the most horrific tragedies to befell the United States occurred in New Orleans, and the Gulf Coast areas of Louisiana, Alabama and Mississippi, when Hurricane Katrina slammed into the the North side of the Gulf, leaving behind a level of devastation of unimaginable proportions. Over 1800 people lost their lives, and thousands, upon thousands of animals were left to fend for themselves. Today I wanted to pause and remember, and hope that all of us have learned something from this terrible tragedy. As I was reflecting today, I visited Petfinder.com's website. 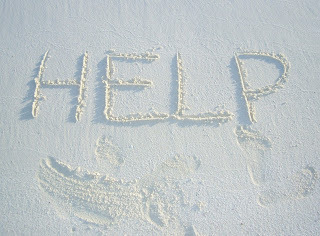 I remember two years ago, blogging and posting about the needs of the pups down in Katrina, and doing whatever I could here in Indiana to help by getting the word out about crews traveling to the Gulf Coast from Indiana and helping to solicit for needed supplies. I felt helpless, as I am sure many of you did. Petfinder still maintains their Katrina (and other disaster) dbase. 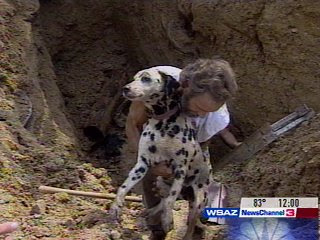 They have helped reunite over 3200 pets with their owners since Katrina and Rita. Thank you to them for continuing this massive endeavor. During Katrina, there were so many stories of heroism, so many stories of sadness and hope, of loves lost and loves found. A very sad time, and a very awakening time. This picture is of pup #PF62549, a Labrador Retriever mix, who doesn't have a name and who has still not been reunited with his owner following Katrina. He was rescued on Music Street in New Orleans following the Hurricane and brought to Los Angeles. A New Leash on Life in Rancho Palos Verdes, CA, is his latest caretaker. And they are still trying to locate his owner. If you recognize this pup and know who he belongs to, contact them and help him find his family, wherever they may have landed on their feet. ...so that we may never forget. I see a lot of Gracie and me in this vid from Merrill Markoe and thought you would enjoy it. If you aren't familiar with Merrill, she's been a writer for the David Letterman show in it's early years, as well as an acclaimed author of several books including the newly released paperback version of 'Walking in Circles Before Lying down', the story about a woman's confusing search for love and the divine acts of dog. Are you ready for Howl-o-ween??? Mum and I had a bit of fun last night putting together another Squidoo lens. This time it's about Throwing a Howlin' Howl-o-ween Pawty! Last year, for the little Halloween agility party at the training center, Mum dressed Gracie and I up like 'little prisoners' for Halloween; she dressed up like a copper, 'cause she really had to control us, LOL! It was fun! This year have fun and dress up your pup for Halloween, and it's a great time to have a pup party! Check out our new website page for fun ideas! 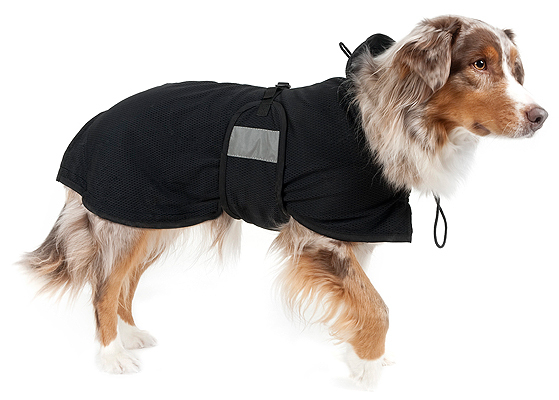 For our friends in the UK, we found a great way to save on everyday items from great pet products, to even cool and necessary stuff for two-leggers. Webbyplanet.co.uk is an online community that helps shoppers save money and make smart purchases. On the site you will find online voucher, products, sales, reviews, and rebates. We are back from the CPE trial this weekend. This was my sis Gracie's weekend! She got to run and I didn't! What's up with that???? Mum wanted to work on Gracie's focus this weekend in the hopes that she would be more 'together' during her runs like she is at practice. Since I had a great view of the ring, I can tell you that she had some really great moments and some really horrible ones. But she had a blast all weekend, fur sure! 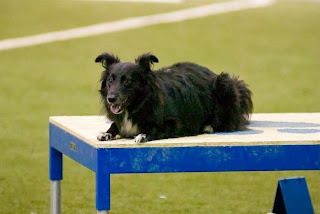 Some of you may not know that CPE is an agility venue that is great for beginners dogs. They have a wide variety of levels, and in levels one and two you can run in 'exhibition' with your pup on a leash for focus and control. This is a great venue for pups like Gracie who need focus or for those pups that may not know all the obstacles yet. And the folks are much more understanding of beginner dogs, which is nice. Saturday Gracie ran Standard and Colors. At first Mum thought she would just run Gracie on leash, but scrapped that idea before the run. Mum led out again, which works really well with Gracie's focus. She has an incredible start line stay. And Mum can have her attention from the start. Gracie took a few obstacles, missed a jump, took a couple of jumps, missed one, but seemed fairly focused throughout the run. No Q, but good experience. About the same thing happened on her other run for the day. On Sunday Gracie had her first run and just ran off in a fit of happy play! Her second run, though, was her best of the weekend. She took nearly 9 obstacles in a row, including 5-6 jumps in a row, before she ran off. And I think she may have taken those obstacles in about 8-10 seconds flat with some distance from Mum. She is a fast one, that Gracie! Mum came away thinking she just really needs to get those commands out 'waaaaay, waaaaay' earlier than she has been. Gracie looses her focus the split second she doesn't know where to go and she plans way ahead. She and Mum have lots of timing issues to work on, but they both saw loads of potential after this weekend. Mum says that Gracie is a very different dog to run than I. And she has to think totally different about how to direct her. The nice thing is that none of us feel that Gracie is getting stressed out there anymore. She's just having a whole lotta fun! Sometimes maybe too much, but it's great that she loves it. Gracie is gonna be a real good agility dog, once her and Mum get it together. She is super fast, and a great jumper; loves her contacts. She even had enough control to get some weaves in this weekend, which was huge!!!!! It may take some time for the two of them to be a team, but what a team they will be! Mum ordered some pics of Gracie jumping, and says they are real good! We should get them in a couple of weeks, and I'll be sure and post them. Cool Dog Site of the Day! Cool! I am incredibly honored today to receive the Cool Dog Site of the Day from DogMark.net! Now I'm up for Cool Dog Site of the Month. If you get a chance, be sure and go vote for me, K? You will need to provide your email address in the voting process. 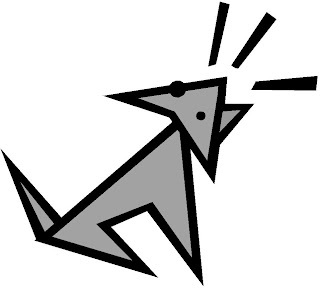 Dogmark.net's Cool Dog Site of the Day started way back in April 1996. They introduce Cool Dog Sites everyday. There are over 4000 selected Cool Dog Sites that you can visit in their archive pages. Their visitors are from more than 68 countries around the world. 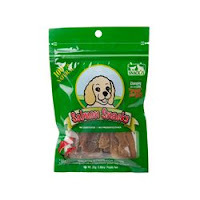 And the site has received many awards and has also appeared in several magazines like Fido in Sweden, and Dog Fancy in the US. Mum and I stayed up late last night putting together something 'Fun for Friday'. And here's what we came up with. A new Squidoo lens entitled "The scoop on doo!" Check it out, we don't think you will be disappointed. And while you're there, be sure and rate it and leave some droppings, K?! A little first aid - part deux! Gross alert!!! But valuable info......read on! How to induce vomiting in dogs is a very valuable tip to have around - and I have to say we've used this one a couple of times at our house. One day, while Mum was out mowing the lawn, Gracie got up on the counter and grabbed an entire bag of wheat buns. You guess it, she ate all 8 of 'em. Even though Mum had them put way back on the counter. Gracie still managed to get to them. And sometimes accidents like this happen to those that take the greatest care. So that Gracie wouldn't get sick, twist her stomach or get bloat, Mum made her throw it all up using peroxide. Even though it's not comfortable for Gracie to go through - it's much better than what she may go through trying to digest all that bread. She was up and around, playing like a champ, just about 20 minutes later. Inducing vomiting is not always the answer, however. If your dog has ingested a substance that you suspect is toxic, first you need to identify the substance and call the Animal Poison Control Center - 1-888-426-4435 or your veterinarian. This is a wonderful and important phone number to have around and in your pet's first aid kit. Sometimes your vet isn't available and you need immediate answers. It is very important to make sure the substance the dog has eaten isn't a caustic substance, because they cannot be treated by induced vomiting. Instead, vomiting will cause internal problems in your dog's stomach and their condition may very rapidly worsen. If you suspect poisoning, consult your vet, emergency vet or call the emergency poison control number for help. Here's a video on when and how to induce vomiting if you every need it. But remember, this isn't always the solution, you should consult your veterinarian before doing anything this drastic. Click here for more on "Emergency Dog Health Care: Tips & Techniques for Pet Owners"
I have a new two-legged friend! I have a new dog loving friend, over at SquishedBugSmoothie. Recently she did a nice write up on me, my talents and my new blog, Rescue Me. And she's even posting my SixDegrees.org fundraising badge on her sidebar. Now that's friendship! SquishedBugSmoothie is a place where my new friend posts about the things she loves - from others blogs and websites, to videos, movies, music, food, cool finds, books, dogs - and just about everything actually! Go and visit her soon, K? 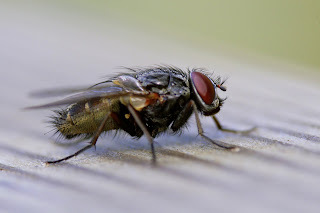 Lately the flies have been everywhere! Not sure if it's the heat, humidity, or both. But some of them get inside now and then. Gracie just loves going after the flies. She will lie in wait, and when they come near she will bite in the air at them. Then go chasing them around the house. The flies get caught in our blinds now and then and she starts pawing at them. Sometimes I think she's tearing them up and we saw that she may have damaged one of them. So we may have to look into new venetian blinds. These flies are a great form of entertainment for Gracie on a very hot day. She has a blast running around the house and tearing up everything! Watch out Gracie!!!!!!! Mike and Tish at BlogsWeLuv started a new award recently, the "I Luv Your Blog Award". Tish, my friend and inspirer presented it to me today! Thanks you so much Tish, I love your blog too! And to make my day even brighter, both Tish and my new friend and constant supporter, Barrett at Huma B~, also presented me with the the "Nice Matters Award". Now I have to say that having two people, humans at that, say that I deserve the Nice Matters Award means sooooo much! Thank you, both of you! Barrett said a lot about being nice in his blog and about how important it is. One of the great points he made was, "we can accomplish so much more if we spend our time and energy lifting each other up, instead of tearing one another down." I have to say that all of my blogging friends are very, very nice and we are grateful for that. The world is sometimes a difficult place for two-leggers and four-leggers; and I, as I am sure you, find that sometimes people are not very nice. So, I have a project for you today, or tomorrow! If someone is nice to you, be sure and remember to tell them thank you, K? And if someone is not nice to you, try being nice back and see what happens. Just maybe we can make a difference, one two- and four-legger at a time! Huma B~ - I always enjoy stopping by to see what Barrett is writing about! 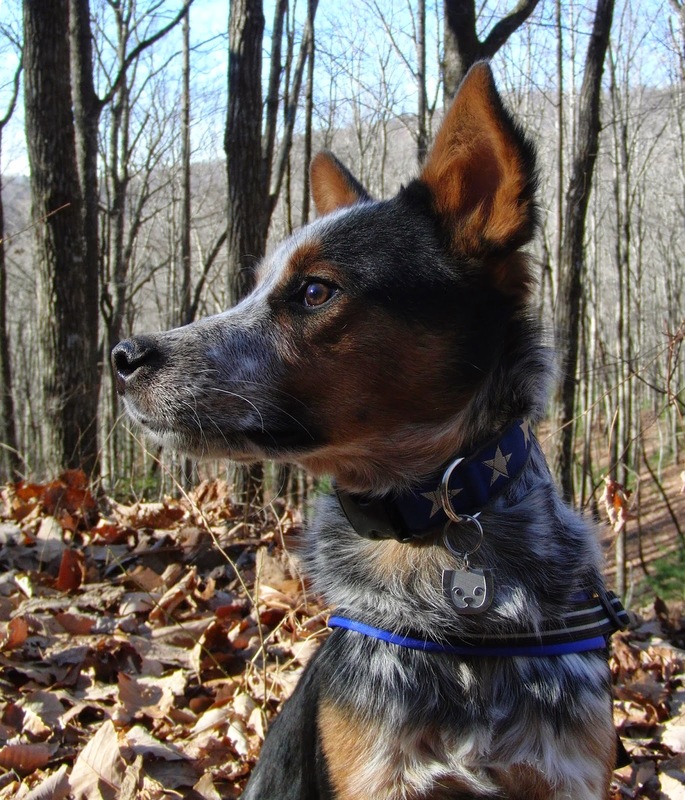 DWB News - The new blog from the DogsWithBlogs crew that has great news on all our members! 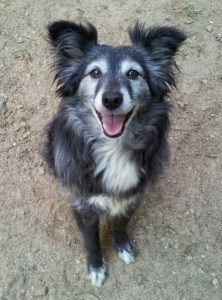 Southside Animal Shelter - The brand new blog from the folks at the shelter where I was rescued! Welcome to the blogosphere! If I lived in South Park! A friend of mine, who requests to be nameless, created this version of me! 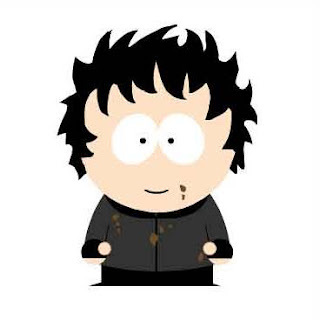 If I lived in South Park.....this is what I would look like. Hmmm....guess I turned human. Well, as human as you can get in South Park, right? Also I have a lot of dirt on me...well, that's normal. BOL! During my friends Tish and Mike's ferocious round of blogging during Blogathon 2007, they had a contest and drawings for Polliwogs, and I won one! Polliwogs are cute little pewter tadpoles that are considered good luck charms. Well, I could always use a stroke of good luck, especially in November (that's when I always seem to get hurt somehow. But not this year, 'cause I gots my Polliwog!). Once I got it open, I saw the Polliwog came on this really cool postcard. Mum!!! Give it back!!! I turned over the postcard and there was the Polliwog! Cool! And my kittie brother, Wiggy, he just had to get in on the act. Hey, Wigs - leave my Polliwog alone! I want to thank Polli at Polliwog for sending me this great little gift. Mum is putting it up on the shelf so we can admire it, and keep it out of our tummies! Now here's a new fun place to visit! PetPop.com! PetPop.com is designed by pet lovers, for pet lovers. All pet lovers! It's a new pet community where the focus is solely on the pet. Whether you are looking for other pets just to make friends, or to show off your pets best pics, you can find it all at PetPop.com. Petpop.com is place for pets from all over the world to mingle, exchange ideas, learn from one another and play. And they've created a "PetStar" section, where you can show off your pet’s talents and intelligence. Members can vote for other pets, too, which can possibly open up doors in your pets the future! Note: This is an exchange post. Gracie got her presents from me the other day! You may remember that I entered a contest held by TipTail, to get her a gift certificate from Doggonegood.com, and I won. So I ordered her up some good stuff for her birthday and it came in the mail the other day! She really likes the new toy! And she loves the Salmon treats! Hey Gracie, you gonna share???? What's a dog to do with $1 Million? Ole Speedcat tagged me with this interesting game. 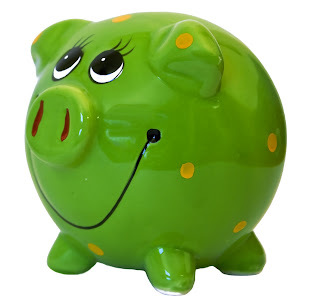 I know two-leggers think a lot about money, and they say that money makes the World go around. Me? I think I'd be pretty content if me and my pack just lived off the land. But in the interest of daydreaming what I could do with $1 Mil, I'll play along! If I had a Million Dollars, I'd help rescue more pups! Fur sure! And maybe have my own agility practice field. Proposition: What would you do if you had $1,000,000.00. 11. OndeOnde will quit her job! 25. SpeedCat will Buy 2 golf holes! 26. 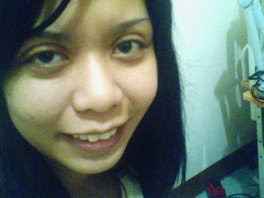 Florencetoh will settle her education & ensure her family’s future is looked after. 31. JaniceNW will give it to charity. 32. 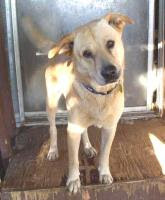 Johann will help rescue more pups, and get his own agility practice field! I tag - TipTail.com, Casey & Peanut, Casper, GollyLog, and Pacco de Mongrel! 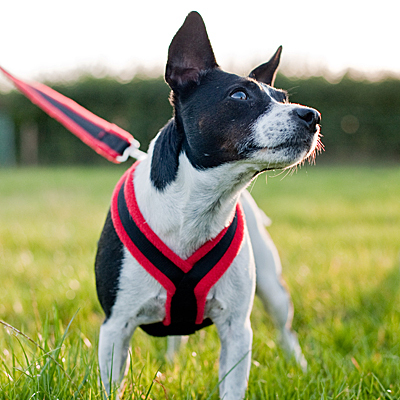 Don't forget about the Fun Things to do With Your Dog Link Love project! We've started a great list of great activities you can do with you pup, but we need you to add to the list and get a little link love in the process! If you are a dog blogger or just have a pup, you can participate. And, it's easy! It'll be winter before you know it! I know it's only August, and it's 92 degrees out there. But it will be Winter before we know it. And we'll be stuck inside on the really cold days with nothin' to do. The nice thing is that we don't have to quit agility practice during the Winter because our trainer uses a friends barn for us to train in. I absolutely love the barn - dirty, dusty, smelly - just a great place for a dog like me to want to be. The only thing about the barn is come January and parts of February, it can get down right cold in there, even for me! Sure would be nice if this year they could put in some propane heaters in there to keep us just a little warmer. But I'll tell ya, I'm not gonna complain, 'cause I'm just lucky to get to do agility in the Winter! Full trial recap - It's a long one! Some of you may know that I was kind of 'slow' last summer. It is not the case this summer! Mum thinks we were all going through stuff last summer; Gracie joining our family, Mum and I starting to get our 'stuff' together doing agility, and of course we were just really starting out. Now we are becoming a real 'team' and it sure makes both of us feel more confident and proud. There was proof of that this weekend, which it why we both feel this weekend was a big one. Saturday I had six runs - Jumpers, Snooker, Standard, Pairs, Gamblers and Steeplechase. Sunday I had five runs - Jumpers, Snooker, Standard, Gamblers and final round of Steeplechase. Saturday started out with a bang! Mum and I both love it when we have Jumpers as our first run. It's usually pretty darn fast, which makes for new challenges, like off courses and such. But we both kept it together in a real nice, open, fast course. Mum did only rear crosses with me, which I'm really liking, and there was a nice fast tunnel to tunnel. We ended up third place and a nice Q to get our Masters Jumpers title! That's the Jumpers course on the left, you can click on it for a larger version. Next up was Gamblers. It was one of the roughest gambles we've seen - not the gamble part of the course, but the opening set up. There was just no place to lead in to the gamble because of a chute in the way. Mum admits she was just a little bit intimidated by this gamble opening. We ran it and Mum ran out of obstacles to direct me to, tried putting me over a jump, which I refused, then the buzzer sounded and there just wasn't a nice way to lead me in. So we ran off happily. No first Masters Gamblers Q today! Next up was Standard. By this time it was already noon and I was getting tired and hungry. We ran standard but I just wasn't all there and was totally focusing on getting something to eat! So we were over time. Mum learned this weekend to feed me more throughout the day in little meals, and it helped hugely on Sunday. Next up was Snooker. After Mum fed me a little snack, I was up to speed again. We were doing great, going for a Super Q, since we have 6 Snooker Q's already. Opening was flowing, with two sevens, then we went into the 2-7 sequence and I took an ambitious off course. Mum didn't give me the que soon enough. So no SQ again. Then it was time for pairs. We were paired with someone we remembered from starters. And what we remembered was that they weren't that 'together'. So no pairs Q.
Steeplechase was the last run of the day. Mum was worried because by this time it was almost 5:00, pretty long day. She fed me a little meal, and decided to really push me through the course. It had two sets of weaves, which right now aren't my strongest, speed-wise. All that pushing really paid off and we got fourth place. And that second Steeplechase Q to get us the National Qualifier for Cynosport. We got home about 6:30 PM, way too late, and crashed. Got up Sunday and had Jumpers for the first run, again. Mum decided since I just got my title, that we were going to work on loads of speed. Didn't happen. The leash runner was a 10 year old boy, who, when I sat at the start line, came up behind me to get my leash. Mum didn't see it until it was too late. And it just freaked me out. I turned around and started barking at him. Mum got my focus and decided it would be best to run, since there was only one or two left to run in 16 inches. And it would be a good focus experiment. Well, I passed! Yes I took a jump, turned my head to bark again at him, took another jump and turned my head and barked at him, and this went on for about 2/3 of the course. Mum yelling 'come', 'come', all the way. We finished just 1 second over time, and the crowd went wild!!!! Our trainer yelled from the stands, way to control the situation, Leslie! And the judge just went on and on about what a good job Mum did in keeping me focused. I just have to say, I really trust Mum, so I do what she asks, no matter what. But I also have to say - maybe kids shouldn't be allowed to leash run around a bunch of herding breeds, unless they know the proper etiquette. Just doesn't mix very well. I know you say I should get over it, but we've tried. Kids, just aren't my thing. We made the gamble in plenty of time and got a real nice third place for our first Masters Gamble Q, not bad out of just three attempts. Mum ended up taking the two jumps to the tunnel, we did the tunnel twice, then jump to the a-frame, jump, back to the a-frame. Since it was a 1-2-3-5, time went pretty fast and we were going over the jump toward the first gamble jump when the buzzer sounded. Good timing luck on our part. Then it was time for Standard. We were doing pretty well, but I had a real slow teeter, so we ended up a couple of seconds over time. Mum and I are going to work on teeter and weave speed this week. That's what's killing me on my standards. Next up was Steeplechase. Mum had a hard time deciding if it was worth me doing another run with two sets of weaves before our final run, Snooker. But we did it anyway. Mum pushed me hard and we ended up with third place! I also earned Mum's food money for the weekend with the cash proceeds from the run. Guess it's now official, I'm a professional, BOL! Last run of the trial was Snooker. Mum decided to push me again. We were going well, not too bad on the teeter this time too, and started into the 2-7, which was a triple. Mum pulled me too hard after the triple and I trashed it. I have to tell ya, I hate knocking bars! I gave Mum a look she'll probably never forget after I trashed the jump. She gave me a real good boy, and we ran off. She told me sorry! And gave me a good rub down and loads of treats. After the trial, Mum went and ordered a couple of photos of me that should be here pretty soon. We'll post them for sure. Then we started cleaning up and loading the car. A friend was helping us, and as he was folding the chair, the dog that was bunking next to us, bit him! Oh my, there was blood everywhere. Mum ran out to the car for the first aid kit, and as she ran out the door, she saw the mess of blood in the lobby. By the time she got back, the facility folks had patched him all up. They had to have a big meeting, judges, tournament officials, etc., to decide what action would be taken. I was in my crate next to Gracie and have to tell ya, it was kind of scary! Our friend is fine, but I'm sure pretty sore today. Those dog bites hurt! Mum got a couple before in the past. We also had time to talk with both the judges this weekend, which was real nice. They were great! 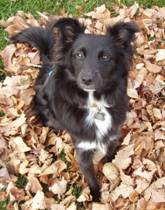 The Master judge said that I looked just like her border collie back home. Megan is her name and she comes from herding lines. She's bigger than me, but I guess I have another twin. And the other judge said I looked just like her best friends dog, so I guess I have, well, another twin! I got to play around with them a while before they left for the airport. They missed their 'kids' so I tried to fill in for a bit. It was fun! Gracie had a rough weekend. Even though she was incredibly focused in the practice area, she didn't take more than one obstacle in each of her three runs, and ran off every time. She even got loose from Mum during another dog's run and ran out into the ring. Good thing that dog was running off too. Mum felt soooooo bad. She yelled out "I'm so sorry!" to the lady, but she didn't get to tell her in person. Mum has to rethink about what to do with Gracie again. She does so extremely well in practice, and did real well at the training center. It's just when she gets to a trial. People say Gracie is stressed, but Mum is not so sure. Mum thinks she just wants to go and play with all those dogs running around. And because she can't, it makes her stressed. We took the day off from agility yesterday, but, barring too much rain in the next hour or so, we are off to training this morning! We're back from the USDAA trial, and it's late - we are sooooo tired. 1. I got a real nice Q in Masters Jumpers today to earn my Masters Jumpers title. It's my first Masters title, so we are super excited! And I got third place. 2. Had a pretty nice run in Steeplechase, despite the fact that it was the last run of the day at about 5:00 PM. It was enough to get fourth place and a Q - so that was the last Q we needed to qualify for Nationals in Steeplechase! 3. We had rough runs in gamblers, standard, snooker and pairs, but who's counting after #1 and #2! Gracie had a rough Standard run, she did get one jump in. We're hoping for more from our competition only 'run off' girl tomorrow. Will report more later, including some course maps, but we have to rest up. Tomorrow I have four runs and Gracie has two. The thieves took all kinds of goods that they need to take care of the dogs and cats; things like laundry detergent, paper towels, bleach, dish detergent, newspapers, toilet paper and more. This is very sad and they are now in urgent need to replenish these items. Here is a link to their wish list. If you, or anyone you know, would be willing to help out, give them a shout, K? They could really use your help. We're gonna make some calls today and see what we can do. And if you'd like to make a monetary donation, click on the Blue/Green badge on the right side of my blog (scroll down a big, K?). Several folks have asked me what happened on the Oprah show today. Well, we had to DVR it, but we finished watching it a bit ago. I'm sure this was a repeat of a show that aired earlier, but we had missed it before. The sad part is it showed Oprah's Golden Retriever, Gracie (my sis's namesake) on the show. Many of you may know that Oprah's Gracie passed recently. They added a clip to the show in her memory. Very sad. Here is a link with quite a few vids of clips from the show. If you have to be selective, be sure and watch the training ones with Tamar Geller, the one with Dr. Martin Goldstein, and the one with the Gibson - too cute! Sadly I can't get the vids on Oprah's site to work right now. Hope you can! We were just watching The Today Show and they showed a promo for Oprah's show today. She will be featuring her pups, and some dog training advice from a pro. Check it out! Click here to check your local TV listings. Gracie went to agility practice without me! Since I've had a couple of weeks off from training and agility to rest up from the car accident bruises, Mum took Gracie to an open practice at Pawsitive Partners Dog Agility Training Center. And I didn't get to go! What!!!! Mum wanted to get Gracie in a building and work on her focus, contacts and weaves, since our next USDAA trial is this weekend in an air conditioned building, and the following weekend Gracie is signed up for two runs on Saturday at the CPE trial, also in a building. Then they ran a full course, about open level in difficulty. Gracie ran around the first jump, but took the second. So Mum brought her back to start at the beginning. Then Gracie did real well! She took all the right obstacles, was pretty fast, (although not zoomie speed), and did real well with a couple of hesitations on the table and in a tunnel. But Mum was proud. Mum ran her in the same course a couple of more times and Gracie got more and more speed and more and more focus as time went on. And she did great weaves, even independently with not any help from Mum, that was great!!!! So we are off to a USDAA trial this weekend. Mum and I are pretty excited to run in this new facility. Not only does it have air conditioning, but the flooring is new soccer flooring with black rubber pellets in it for extra cushioning. I'm signed up for all the runs accept Grand Prix. And Gracie is signed up for Standard on Saturday and Standard and Jumpers on Sunday. Woo Hoo, we get to go do agility this weekend! We had a big day yesterday. Mum took me to the doggie dentist, yikes! After the car accident, our primary vet noticed that I had a chipped primary molar, and we weren't sure if it happened in the accident or not. So Mum wanted to have it checked out. We spent over 1.5 hours with the dentist and dentist technician and learned loads about canine teeth. Mum says she knows more about dog teeth, repairing teeth and root canals than she ever knew before. They were so nice about explaining all the possible procedures. They recommend that we get it 'fixed', whether that would be with just a coating of resin, or a root canal, or even a cap. So we're looking into it. For a pup, dentistry is quite more complicated than for humans. Mostly because they have to do this when we are 'sleeping', not when we are awake. So all the anesthesia processes have to be in place, including pre-op blood work. Of course along with more complex processes, come more money. It's pretty expensive for a pup to get their teeth fixed. And since it's my primary molar, it's a pretty important tooth. We also talked to the dentist about how Mum could get the tartar off Gracie's teeth, since she 'came with bad tarter' from her rescue situation. He said it's so important not to scale or scrape teeth, unless they are polished after by a dentist, 'cause it can just make the tartar worse over time. And it's really best not to use baking soda (which kind of surprised us, but now makes sense). He said the very best way to take care of your pups teeth is brushing with doggie toothpaste. We use CET, which he also recommended - it has safer ingredients than most toothpastes you get at pet superstores, and won't aggravate my IBS. We did a Squidoo lens on brushing dog teeth recently. You should check it out. Keep those teeth looking, feeling and working great, K? 'Cause they are sooo important! Mum loves the beach and after doing beach agility not too long ago at a trial, I kind of like all the sand too! And the surf, and the water. All sounds really fun. Unlike most shelties, I kind of like the water. I get in the pool on a hot day, don't mind the rain, and love to go wading in the river when Mum and I go canoing, and I run loads faster in agility when it's raining. It sure wouldn't be to shabby to live on the beach. We could go running every day! Play fetch, and get real dirty and smelly. Yum! Mum's been putting some thought recently to getting me in top shape and putting together a conditioning program for me and Gracie. One of the things she's been considering is taking me for a run with a bike. But she worries about how the asphalt road would be on my joints. So beach bicycles and a beach would be just the ticket! We wouldn't have to worry about my joints and would get a great workout, both of us. My friend Sammy the Surf Dog talks about the chirpy birds that live there and how he wants me to come and herd them away for him. I could do that! Cool! 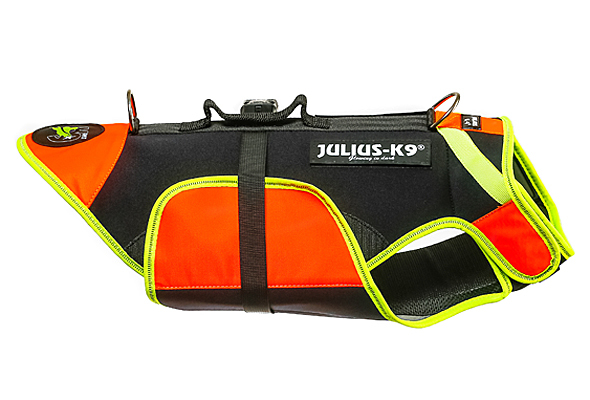 Canine CPR is Lens of the Day on Squidoo! Woo Hoo! My new lens on Canine CPR received a great honor yesterday. It received the coveted Lens of the Day distinction. Thank you Squidoo. We are humbled to be among the elite of the Squid. Here's to many lenses together! And I want to thank my friends, Tish and Cruella, for giving me the idea of writing the lens. EDIT: Guess there has been a 'jump on the gun'. My Canine CPR lens showed up on Squidoo as a Lens of the Day on Monday, but we found out that it was kind of a mistake, oops! We got great traffic on that lens, which is pawsome that the information got out and people learned about CPR for their pups. Squidoo says to sit tight that there is 'more to come' for us. So we're changing the graphic in this post for now, but we'll keep you updated! EDIT: 8-16-2007-6:42 PM Well, it's official, official! My Canine CPR lens IS Lens of the Day. Thank you Squidoo!!! I am soooo very honored! Saturday is National Homeless Animal Day! The International Society for Animal Rights began National Homeless Animal Day and Candlelight Vigils to publicize dog and cat overpopulation in its overwhelming magnitude, to increase public awareness of the millions of dogs and cats killed in shelters annually for lack of homes and to emphasize the importance of spaying and neutering companion animals. From modest beginnings in 1992, National Homeless Animals’ Day and Candlelight Vigils, commemorated on the third Saturday of August each year, have grown enormously in both number and content. Animal Rights/Welfare organizations, as well as individuals from around the world have taken part in the event to increase public awareness of this issue. 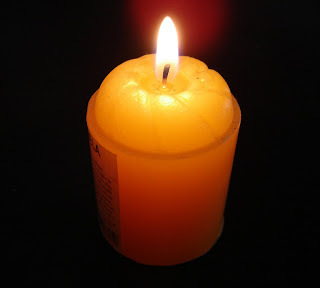 For the sixth year in a row, ISAR is sponsoring their annual online candlelight vigil. Be sure and stop by their website to post messages in memory/honor of those affected by the pet overpopulation crisis. And for information on events surrounding National Homeless Animal Day in your area, click here! ISAR, the first organization in the world to use the term Animal Rights in a corporate name, was founded in 1959 to expose and end the injustice of the exploitation of animals and the suffering inflicted on them. There's a commitment in ISAR's name: to bring about rights for animals, the right not to be made victims because they are weak and defenseless. ISAR believes that because of their sentient nature, animals have rights that are denied them in law and daily life. Animals share more than the planet with humans. Like us, they are capable of knowing pain, fear and other suffering. Fun Things To Do With Your Pup Link Love Project! There are so many fun things you can do with your pups. And I know that many dogs out there would love to have a list of things they can do with their Mums and/or Dads. So, I put together this Fun Things To Do With Your Pup Link Love Project, for us to all have a great list of activities! If you participated in my Fruits and Veggies Link Love Project, you know what to do! If not, read on. There are all kinds of fun activities for us dogs, right? Well, let's make a list! And get some link love in the process. 1.) Copy and paste the matrix of “Fun Things To Do With Your Dog” below, courtesy of Johann The Dog! 2.) Substitute the Host Tag and one of the “Activities” in the matrix with the name of a dog activity and URL of your blog, just like I did. 3.) When you get a ping back from someone that has your link in one of their “Activities”, practice good paw by copying his/her Host Tag’s anchor text (automatically the associated link will also be copied) and paste it over one of your “Activities” below. 5.) Encourage and invite your readers to do the same and soon this can grow fast. And if your not a dog, but your blog about dogs, or own a dog, you are also welcome to participate! Important: Once I get a ping back from you, I will add your anchor text and the associated link you designate as “Host Tag” here, replacing one of the “Activity” from the matrix above. As more and more doggie bloggers copy and paste this matrix, the more backlinks you will have with your anchor text. If everybody who copies and pastes from your blog does the same, pretty soon this will spread and go viral. So, the sooner you participate, the more links with anchor text you will receive. And if you'd still like to participate in our Fruits and Veggies Link Love Project, here's the link to get you started! You may remember that I was entered into a contest to help me get Gracie a birthday present. And you may remember that we won! We got the gift certificate in the mail yesterday! Yeah! So, I think we did pretty well. Thanks TipTail.com! We, oh, I mean Gracie can't wait!!!! We keep going and going? Lots of folks ask how we keep going and going and going. Well, Mum says we're kind of like the energizer bunnies. But we're really herding breeds and that's how we are all the time! Always busy! And now that it's so hot, 90 degrees for 16 days straight, Mum is having trouble occupying us. So what does she do? She plays with us, and trains with us, and grooms us and all kinds of stuff to keep us busy. But she's not getting too much work done around the house. Maybe she needs to get a Panasonic cordless phone battery for the phone so she can call in some reinforcements! We hear they have all kinds of batteries for all kinds of equipment, tools and gadgets. After doing the meme from Brown Thoughts, we went to visit their site and found the coolest thing! So we went for it. Here we are, starring in our very own JibJab movie! Oops she did it again! My friend Tish tagged me. But this one is fun (oh, and imaginary too, btw. Well, at least the questions are). Make a post about being interviewed by an imaginary blog. To see an example, check out Brown Baron’s imaginary interview. Try to make it a question and answer sequence. It can be serious or silly, or both. Please link back to the original post. And be sure to tag a few other bloggers! Imaginary Blog: From what I understand, you are a pretty famous pup? How does that feel and what do you think of all this hoopla? Johann: Well I certainly don't consider myself famous, by any means of the imagination. I just really enjoy my life - work and play. I love bringing 'cool stuff to cool dogs' through my website and our ability to donate 10% of our profits to dog shelters and rescues. And I enjoy my agility, blogging, getting to know other pups through cyberspace. But famous? Not me! Imaginary Blog: But we see you all over the Internet? Why the Internet? Johann: The Internet is THE forum for getting to know lots of other pups. Pups have very fulfilling lives now, and are very busy. I find the best way to get to know them and share info, is through the Internet. That way we can be pup pals, meet up when we get the chance and communicate on a regular basis. I've met some very interesting pups this way, and some that even look and act like me. Imaginary Blog: So what other Internet activities are you involved in? Johann: Of course I have a MySpace and Dogster page. I've been involved in creating educational and fun pages through Squidoo. I also have many sites out there including, WindowsLiveSpaces, SixDegrees.org (where Gracie and I teamed up with Kevin Bacon to raise money for pup charities), CafePress (where we sell a few items and hope to expand to more), WetPaint, Wikifido, PetPlaces, Petster, and, of course, our new blog, Rescue Me, that helps pups in need find their forever homes. 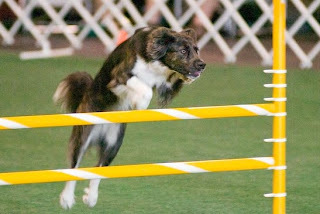 Imaginary Blog: I understand you are quite an accomplished agility dog? What's up with that? Johann: I guess some folks may say that, but I just go out there to have fun, each and every time I run. I've been training since June of 2006 and competing since December 2006. I compete in USDAA and AKC (where I have my ILP as a Bi-Black Sheltie), and I have the titles of AAD, AXJ and AX. I'm very close to getting my MAD and MX, MXJ, which is very exciting. and I've recently become a Grand Prix national qualifier for the 2007 Cynosport Games. 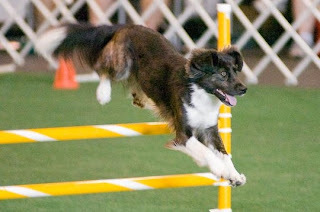 Agility is my absolute favorite thing in the world, besides my Mum of course. I love the thrill of competing, not against other pups, but achieving my personal best. And I love the time Mum and I have out on the course. We are becoming a real team. The best part is that I'm young and we have so much more we can do, learn and accomplish. 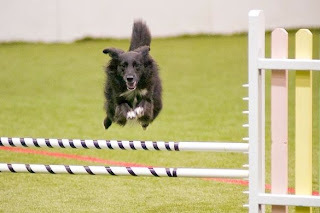 Imaginary Blog: I understand you have a Squidoo lens devoted to Dog Agility? Johann: Yes I do. 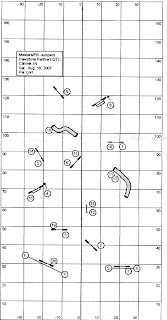 It's a great resource for those interested in getting involved in agility, or even for any level of agility enthusiast. It includes resources for competing, getting started, learning new training techniques, and much more. 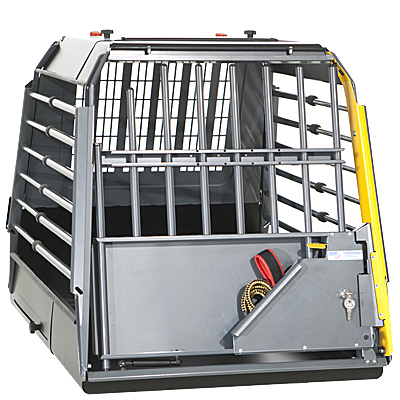 We've recently added a lens for agility equipment, books and other resources, and a lens on dog agility shirts. We are planning more. Imaginary Blog: So what can we see for the future of Johann? Johann: It is my hope that we continue to bring joy, fun, entertainment, education, and much more to the pups (and their 2-leggers) out there. I love sharing my life, with all the ups and downs that come with it. And we hope that all that we do enriches the lives of other pups. Imaginary Blog: Thanks so much for taking the time out of your busy schedule to talk with us, Johann. Good luck and well wishes for your continued endeavors! I now tag: TipTail.com, Sammy the Surfdog, SpeedcatHollydale. I've seen this award around lately and secretly pined for it. Leave it to Tish to bestow it upon me, licks to you my friend. The award was originally created by my other friend Mike of Ordinary Folk and his friend Danielle of Pink Reviews. "I’m sure you’ve all seen lots of comments from Johann on my blog. As if having the ability to blog isn’t enough, he’s a schmoozer too! He trots around the blogosphere leaving a trail of comments wherever he goes. He’s by far the friendliest blogging dog I’ve ever met!" Bet she's glad I'm not leaving anything else behind, BOL!!! 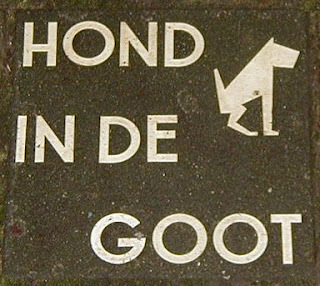 Dog's Aye View - We just love Gomer and Opie. And share lots of info and tips with them. They are everywhere we are, and never seem to slow down. 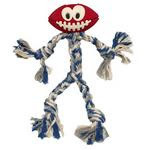 FrogtheDog - Their blog motto is "More fun than you can shake a wet dog at! Frog the Dog - also known as The Pencil Pooch!!" He spends his time helping children throughout the world learn new things. An admiral profession, I must say! The PetsitUSA.com Blog - I certainly enjoy my buds at PetSitUSA, and Mum has found out that she has occasional parallel lives with some of those folks. That always makes our conversations fun! And they always post very educational items with great info for us pups. When it's really hot out like today at 100 degrees, we get pretty wacko around the house. So just like we do in the dead of Winter, Mum does short little training sessions with us, until what she calls 'fries our brains'. We love it and have a lot of fun. And it kind of wears us out a little and keeps us occupied during the day. So we thought we'd share a couple of sessions with ya! Enjoy and let us know what ya think! Halloween, believe it or not is just around the corner. Really! I'm not much of a movie watcher, but my sis Gracie loves watching TV. Her favs are always movies and shows that have other dogs in them. They make her go nuts, barking and running around the house. Cujo, got her hiding under the covers! Scared the beegeebees out of her. Coming up on August 31st is a new version of Halloween - The Movie. Rob Zombie wrote and directed this latest Halloween movie. Now when you look at the original, it just doesn't seem very scary, but with all the new advances in moving making, it's our bet that this will really get Gracie, not only under the covers, but maybe under the covers in the next state, or country! She'll be off like a border collie on sheep, and that's fast you know! Mum is looking forward to Rob Zombie, not just doing a sequel; but totally remaking the original of this classic horror film, and bringing something new and unique to the genre. Keeping cool and keeping safe! Well it's hot!!!! The forecast for this week calls for all 90's and humid, which means it's gonna feel like it's in the 100's. Way too hot for us pups to be out and playing. No agility for me this week! There has been so much talk about dogs left in cars. Seems like it never goes away. So we created a new Squidoo lens to help bring awareness, education and encourage folks to spread the word about the importance of keeping us pups out of hot cars. And it includes information on what you should do if you find a pup locked in a car, how to prevent and treat heat stroke and how to get the word out. Be sure and check out my lens - Keeping Cool Dogs out of Hot Cars! And be safe out there!!! !